Originally introduced in Europe, Designer Banded Shades are also known as Zebra Shades, Double Roller Shades, Twinlights and Mezzanine Layered Shades. Banded Shades offer a unique control of light and privacy. 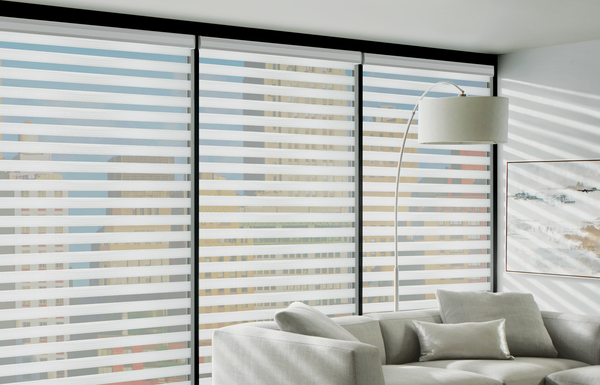 This shade combines sheer fabric with bands of solid fabric that allow you to control your view. With the shade down you can move the shade to the view position that lets you see outside while maintaining some privacy and softening the day light. At night time when you want privacy you can overlap the bands, providing you with privacy. These shades come in different opacities, light filtering, room darkening or light dimming fabrics. Fabrics are available in a variety of textures, colors and band heights. Band heights cannot be specified. Choose a band height that will best suit your view-through preferences. Hunter Douglas offers great geometric designs. Shades are offered with a rounded or squared fabric covered cassette eliminating the need for an additional valance or top treatment and include a fashionable bottom bar. Operation systems can be manual with a chain, motorized with a remote or can come with a soft touch power wand which is attached to the shade. Come in to our Showroom today and view your design options. 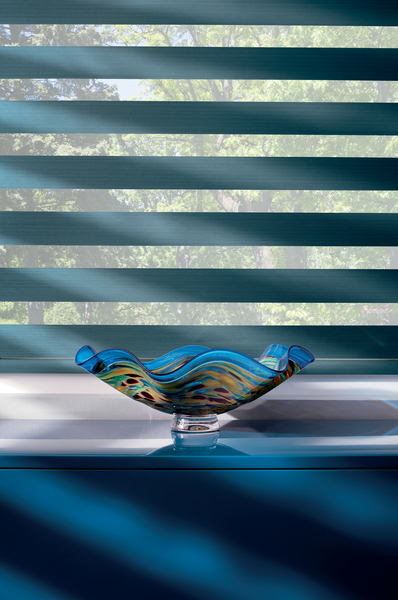 For your Designer Banded Shades, visit the Blinds and Designs of Florida showroom. Or complete our contact form to receive your free estimate. Servicing Sarasota - Bradenton and the surrounding areas, including Venice, Parrish, Ellenton, Palmetto, Osprey, Nokomis, Siesta Key, Longboat Key, Bird Key, Lido Key and Casey Key.